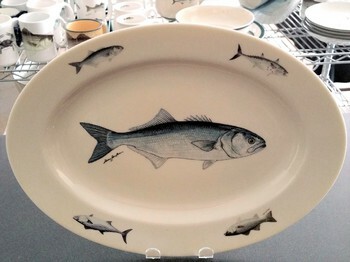 This 14" oval platter is made of fine porcelain china with a natural glaze that compliments the dinnerware. Decorated with the Bluefish in the Center and Northeast Fish Series around the rim (Striped Bass, Bonito, Bluefish and False Albacore). All original artwork is by Dann Jacobus.